Musical artist Jason Gallaty, better known by the moniker Theophany, is a video game soundtrack remixer and active member of a number of music and arts projects within the digital realm; namely OverClocked Remixes, Ember Labs, and Enig’matik Records. However, his tracks are a tier — if not tiers — above the majority of other remixers and such fetal artists on the net. 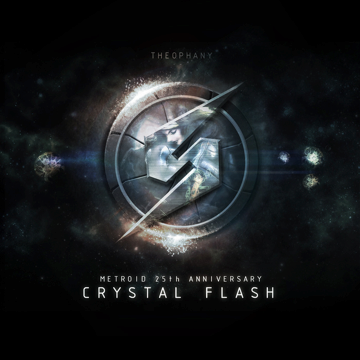 In August 2011, Theophany released his debut Crystal Flash EP; specifically for the 25th Anniversary of Metroid. As one would suspect, knowing this, the record is a collection of tunes from the renowned series transformed into wonderfully sublime creations all his own. Fantastic album cover for Theophany's Crystal Flash EP. Incorporating occasional placid hip-hop and dub elements along with a heartstring ensemble and trickling piano-work, favored tracks from the Metroid series are beautifully poisoned into sweeping scores of crushing sadness and deepest mystery. With Theophany, the perils and wonders of a thousand worlds over can be felt through closed lids and open ears. The final track, “Alone in the Universe”, houses a sense of solitude the likes of which I personally have never before heard in music. To describe the sensation to my fullest, it feels as if a void has nucleated inside of you and threatens to devour your entirety as you realize that you truly are alone in the universe. Yet even with such swallowing catharsis, that wasn’t enough for Theophany. In December of 2012 — on the ominous 21st, to be exact — he released his first full remix album, Time’s End. As if we weren’t already satisfied with a journey through the cosmic abyss, we are shoved over the edge to once again dive into his phantasmal world. 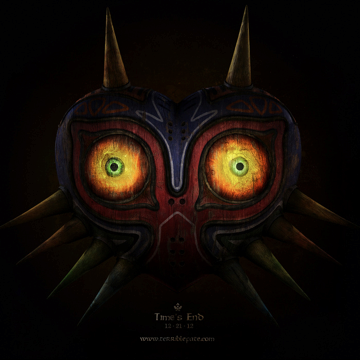 Time’s End is an amalgamation of songs from the beloved and feared video game The Legend of Zelda: Majora’s Mask. Equally, if not more, stunning album artwork for Time's End. For those piteous souls who are unaware, Majora’s Mask quite simply bears one of the greatest game plots of all time, right up there with Shadow of the Colossus and Metroid Prime. In summation, the protagonist finds himself in a strange land where the moon will crash down upon the world in three days time. Using a magical instrument, the hero must heal the sorrows of the people of the land, and ultimately of the demonic antagonist. The storyline is also flooded with mysterious characters and elements of horror to collectively form a twisted realm of anguish and despair. In terms of portraying this world, Theophany was spot on. Each track on Time’s End constructs the chronological reality of the hero’s quest in an incredibly accurate manner. The first track immediately casts the listener into the shadows, where uneasy strings hum a tune of foreboding. In “Clocktown”, some relief is offered as a radiant, Irish harmony washes over the listener. Such innocent cheer is short-lived however, and one may find himself weeping by the end of track five. At long last the album comes to a close with a devastating symphony depicting the end of time, wherein the fate of this condemned land lies in the hands of the hero. All of the pain and hardships accrued, and the flickering hopes and dreams of numerous races, amalgamate in a near singular moment spread over about eight minutes of desolate yet incredible resolution and desperation. Dramatic, I know, but that’s exactly what is so savory and delicious about his music. If you are feeling a bit apprehensive, due to the fact that perhaps you are not much of a “gamer” and do not feel that this music would be right for you, I implore you, bright reader, not to seal your gates. Theophany’s music is an awe-inspiring creation which holds a place in the ears of all who love the music of odyssey, tragedy, and raw effusive power. To get a pleasant sampling, tune in to WRCT this Friday, Feb. 15, at 5 p.m., during Massive Music Weekend, for a half-hour block of Theophany’s mastery. And don’t forget to tune in during all of MMW for half-hour sessions of numerous other artists including Twin Sister, St. Vincent, and Vanilla.